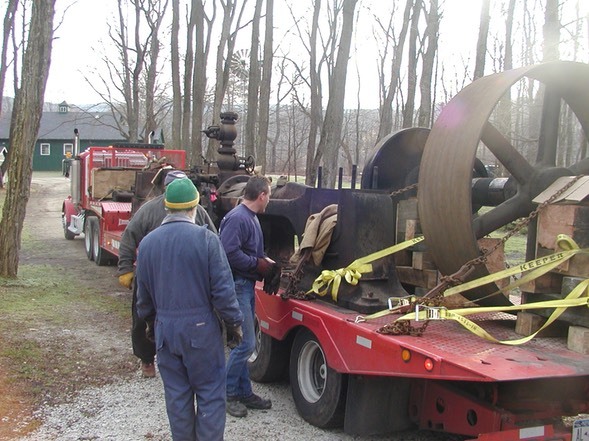 On Sunday December 17, 2006 the flatbed trailer carrying our "new" Nagle-Corliss steam engine arrived in Kent. 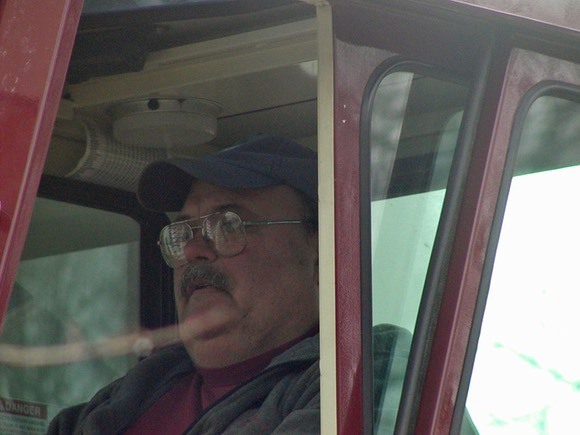 Tommy Laganga of DBL Industries in Torrington was on hand in Kent to off-load the engine. For the time being, this was to be the resting place for the engine until we could obtain funding to set it up in our Industrial Hall. 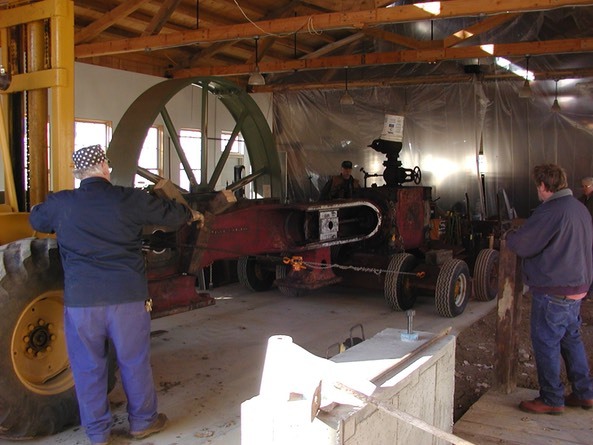 The engine was moved indoors in 2007. The flatbed truck with our engine arrives in Kent. 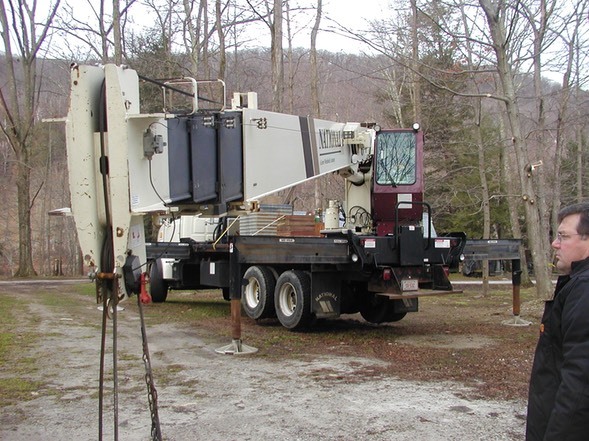 Tommy Laganga is ready to respond with his DBL Industries crane. First off the trailer is the engine frame. The Nagle-Corliss engine frame sets down behind the Industrial Hall. Next off is one of the flywheel halves. The second flywheel half sets down. Tommy Laganga at the controls. 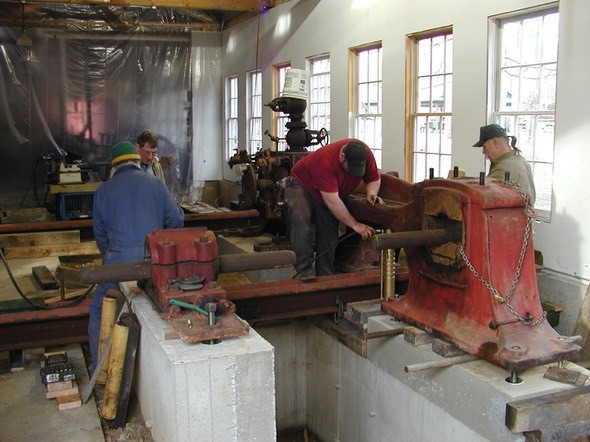 The last major piece, the crankshaft is set down on CAMA ground. With this work completed the engine is greased up at vulnerable locations to protect it from the elements over the winter. John Luchesi of Barrett Roofing came back to CAMA a few days later and covered the engine with heavy rubber to further protect it from moisture. 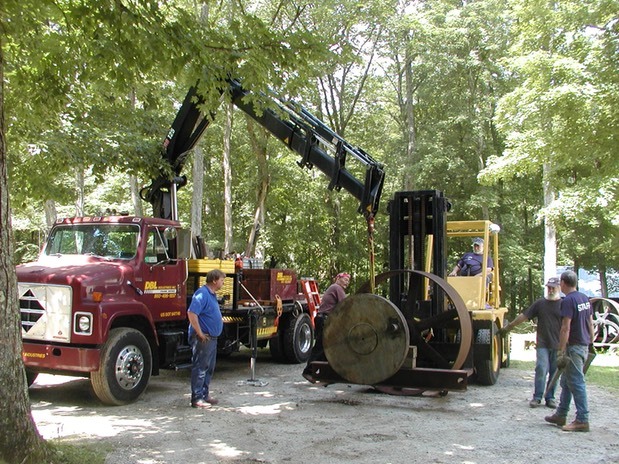 Thanks go out to Tommy Laganga of DBL Industries for donating his time and equipment to unload the engine in Kent. Again, thanks go out to John and Michael Luchesi of Barrett Roofing for their help and also donating the rubber covering material. 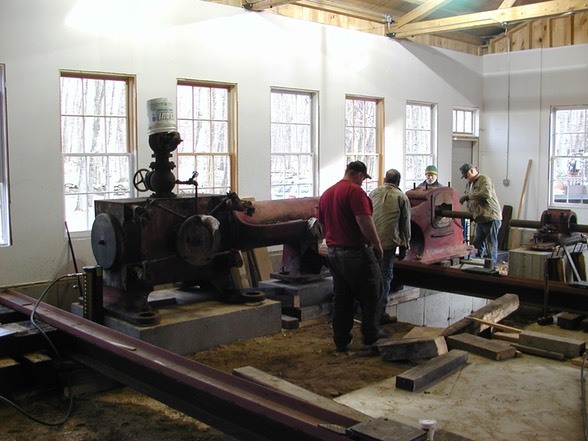 In November, 2007, we began installing our Nagle-Corliss steam engine in the Industrial Hall. The first priority is to provide a firm footing for this very heavy engine. This involves digging a 8 foot deep hole and setting forms to pour a reinforced concrete footing. On top of this is then poured a heavily reinforced concrete base with strong "T" bolts to mount and immobilize the engine frame. 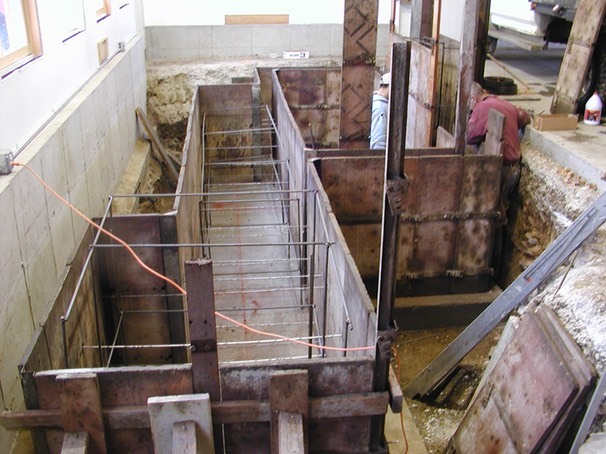 The footing and foundation are poured using reinforced concrete and the engine is prepared to be moved into position. The location for the Nagle is laid out in the Industrial Hall. 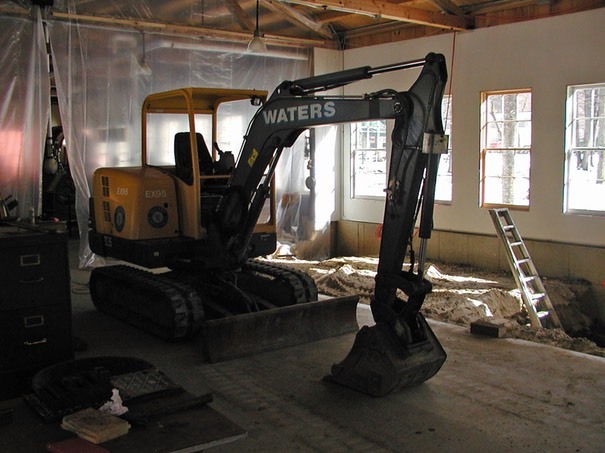 A small excavator is used to dig the hole for the footing/foundation. 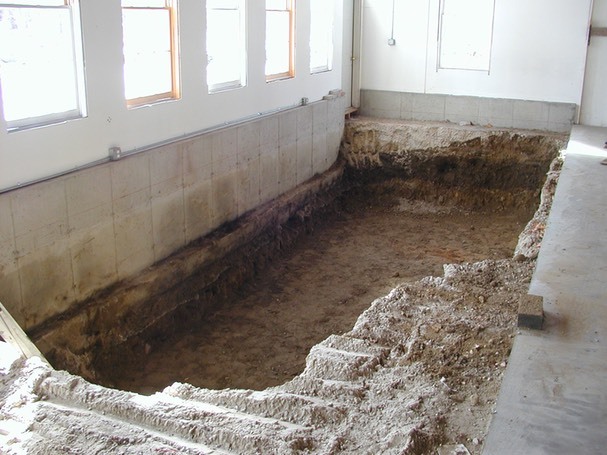 Here, the footing has already been poured with re-bar to tie into the foundation. 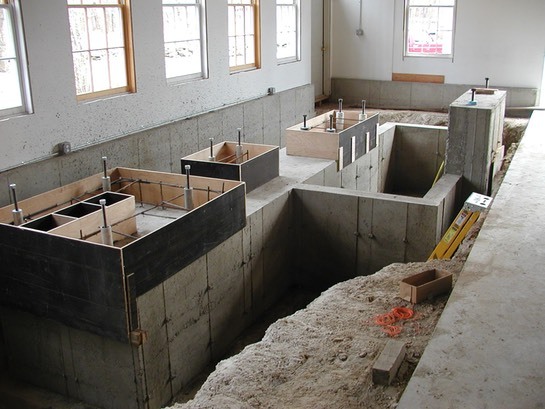 The foundation forms are being assembled in this photo. These hold-down "T" bolts are about 4 feet long. The plastic tubes around each one are used to allow fine-tuning of the bolt to align with the engine frame. The "T" bolts in their tubes are suspended at the proper locations to line up with the bolt locations in the engine frame. Once the frame is set in place, the tubes around each hold-down bolt will be filled with cement grout to immobilize the bolt. The foundation is then poured. The concrete has been freshly poured. The base of the engine foundation is complete. 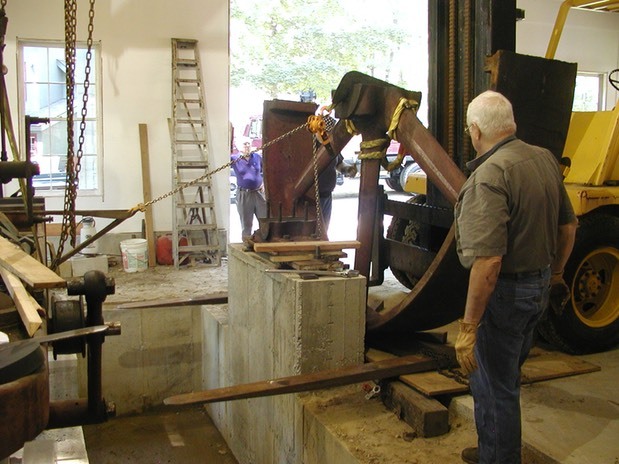 The new forms shown here will make up the final pour for concrete pedestals to mount the engine. 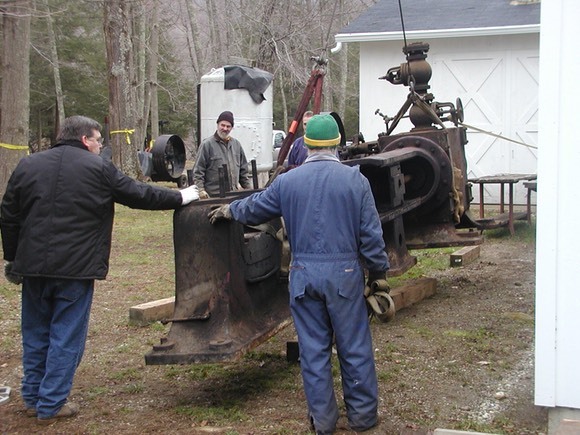 The heavy engine frame is now prepared to be moved into the Industrial Hall. With other large engines, we had the luxury of putting them into position before the building was completed. With no roof, we could use a crane to lift parts into position. 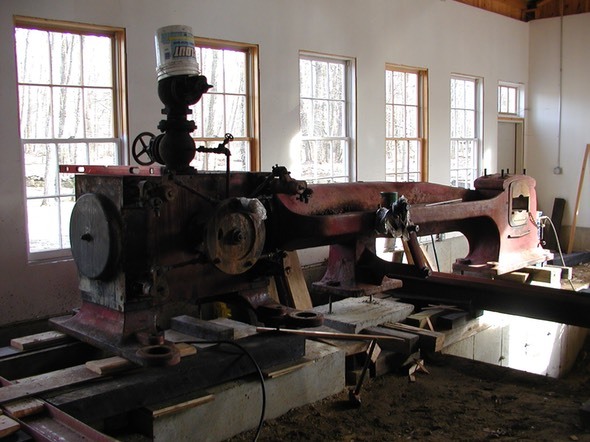 With the Nagle-Corliss engine however, the building was already built so use of a crane was out of the question. We therefore had to work at ground level to move the heavy parts into position. This presented some interesting rigging issues that Ray deZara was quick to work out and put into practice. Ray brought in some heavy duty dollies to set under the cylinder end of the engine. Then, with the use of our fork lift we could now roll the engine frame into position. Here, the engine is shown firmly attached to the industrial dollies. The engine has been rolled out into the open to allow for steam cleaning. 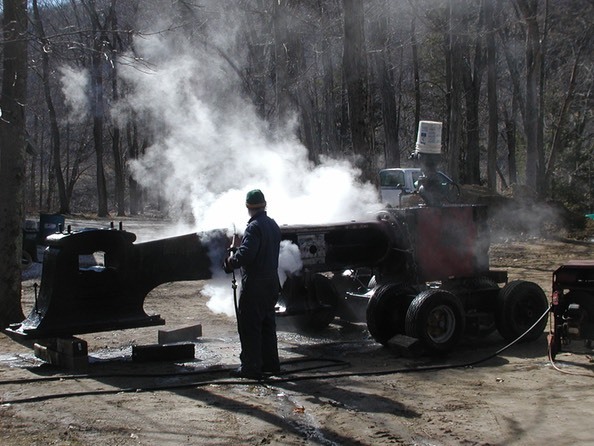 Here, years of built up grease, dirt and grime are removed with a thorough steam cleaning. 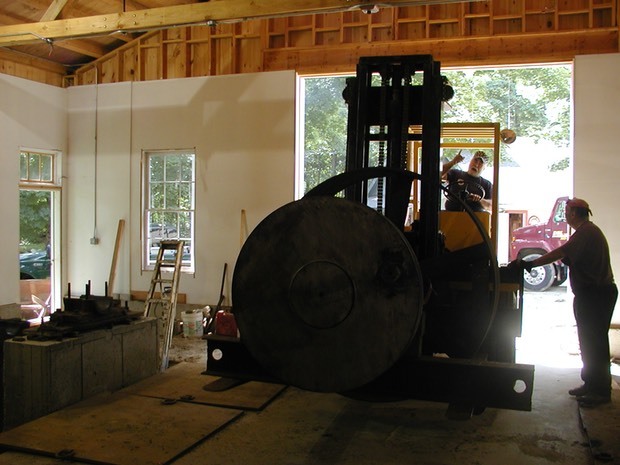 Using the fork lift, the less heavy end of the engine is slung from straps and then steered into the Industrial Hall. The engine frame is now in the center aisle and aligned with the I-beam "tracks" that will be used to roll it into position on the foundation. 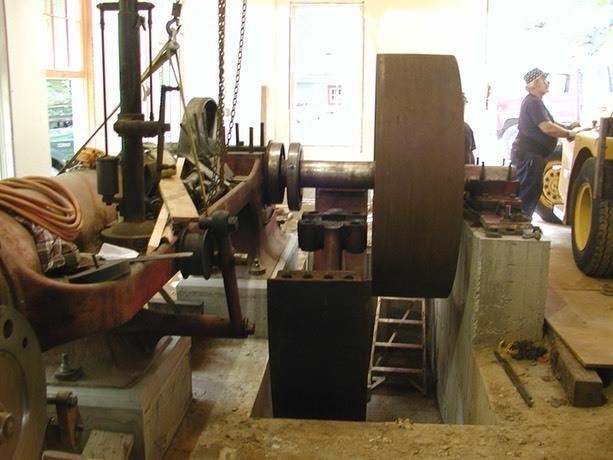 In the middle foreground of this photo, the high pedestral for the outer main crankshaft bearing presents an obstacle. 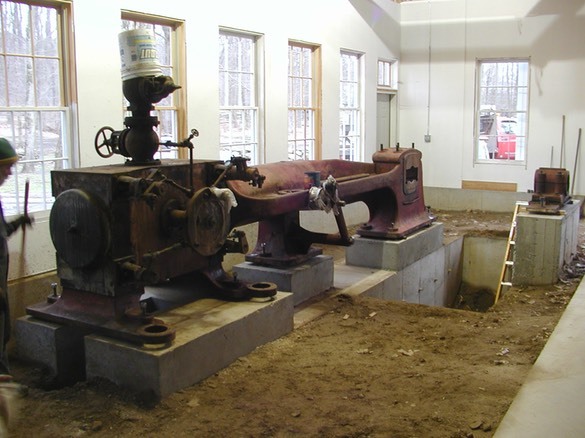 The engine must be rolled east into position north of this pedestal and then rolled south into it's final location on the foundation. The two large I-beams used to roll the engine east from the center aisle are visible in this photo. One is just visible in the lower lefthand corner of the photo, and the other is visible to the right of the center pedestral of the frame. The engine has already been rolled east and south into it's final location. 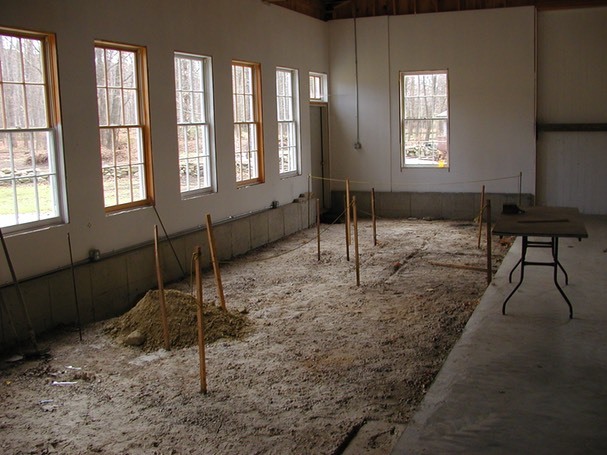 Wood cribbing is used to level the uneven surfaces between the various parts of the foundation. 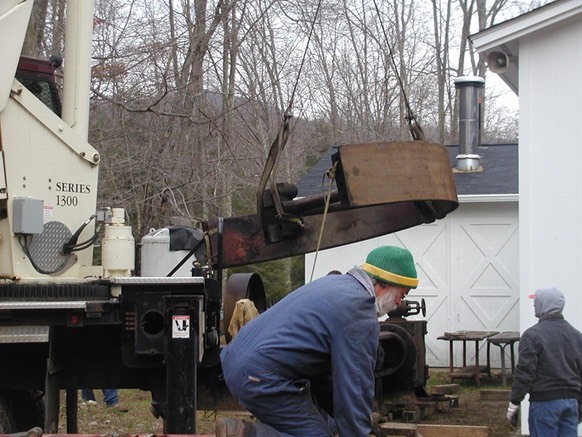 This photo shows the engine 'hovering' on wood cribbing over it's final resting location. The mounting bolts are just visible at various points below the frame. 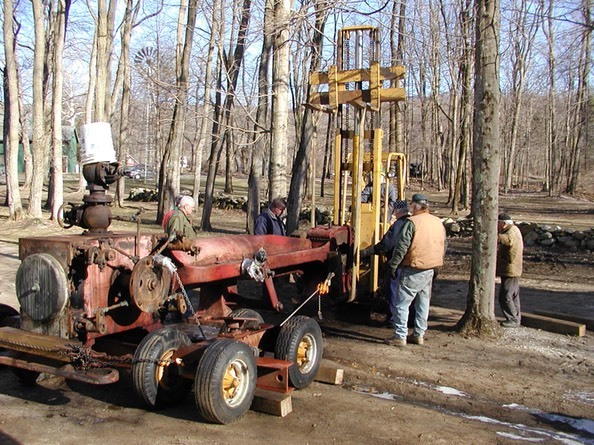 Using hydraulic jacks, the cribbing is removed and the engine frame is lowered onto it's foundation. All the mounting bolts lined up very well. 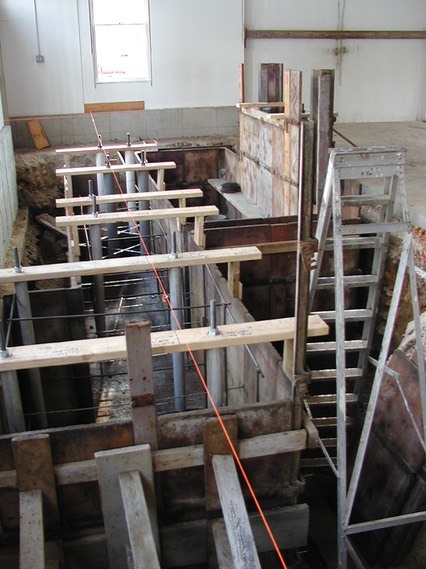 This photo also shows the I-beams used for rolling the engine from the center aisle to the foundation. 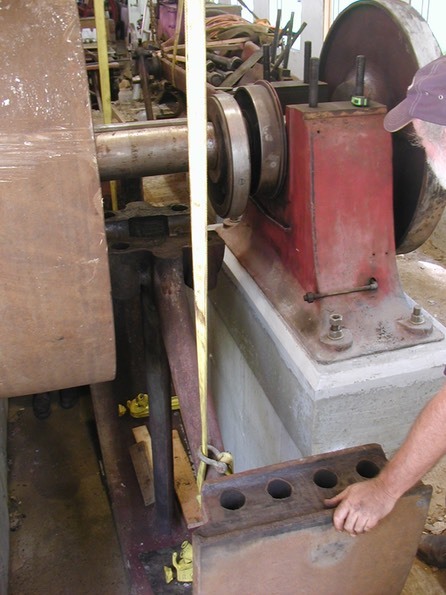 Using shims, a transit, and a custom-made laser alignment tool, the engine is properly leveled and aligned with the outboard crankshaft bearing. The engine frame is leveled and 'floating' on steel shims about an inch and a half above the foundation. This gap will be filled with cement grout which has the consistency of heavy cream. The grout will flow into the tubes surrounding the mounting bolts to immobilize them, thus locking the engine into position. Forms are now built to contain the grout. 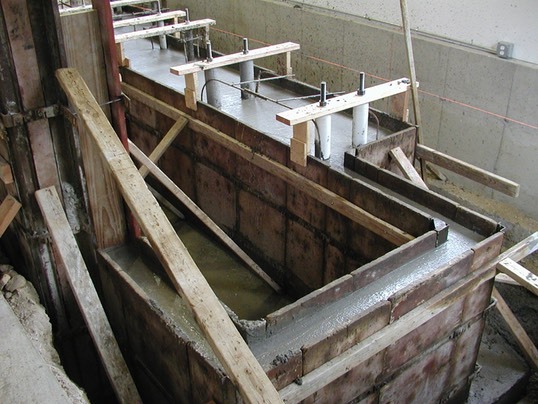 In this photo, the grout has been poured on 2 of the three pedestrals of the main engine frame. The grout is poured so as to encase the base of the frame. This will prevent any movement of the frame during engine operation. 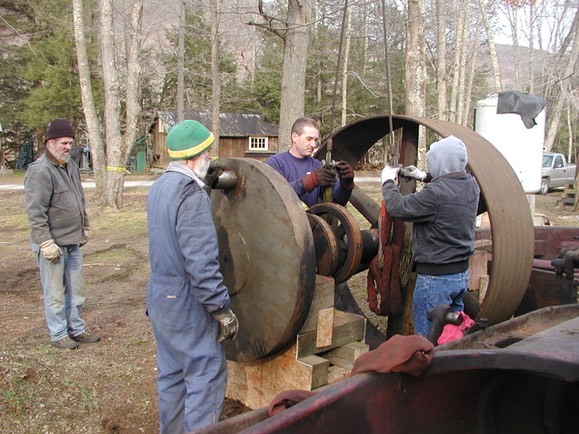 On Sunday, August 10, 2008, a crew of volunteers led by Ray deZara, completed the basic assembly of the Nagle-Corliss steam engine. 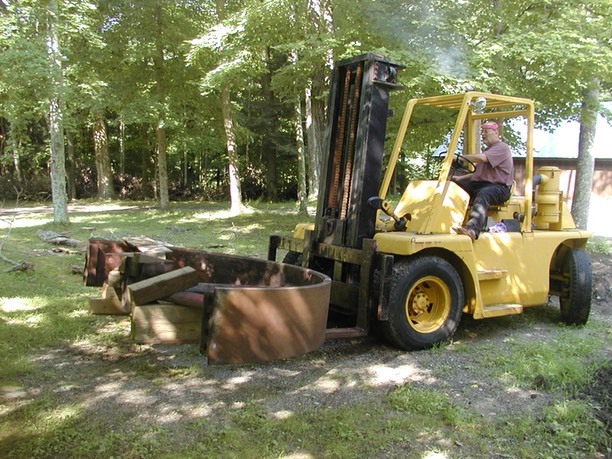 With the use of an 18,000 pound capacity Towmotor forklift (provided by Tom Laganga of DBL Industries), the remainder of the major parts of the Nagle were brought inside and assembled on the frame. This huge forklift presented some maneuverability issues in the limited space of the Industrial Hall. 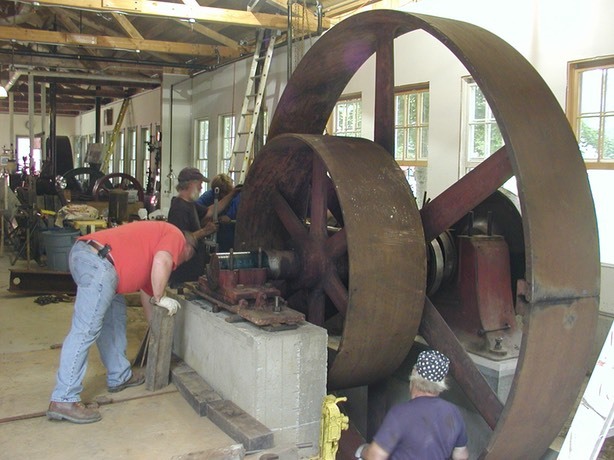 Tom and Ray worked together to figure out the best way of bringing in and install the 2 flywheel halves and crankshaft, often times employing multiple picks and pick points to move the large parts into position. 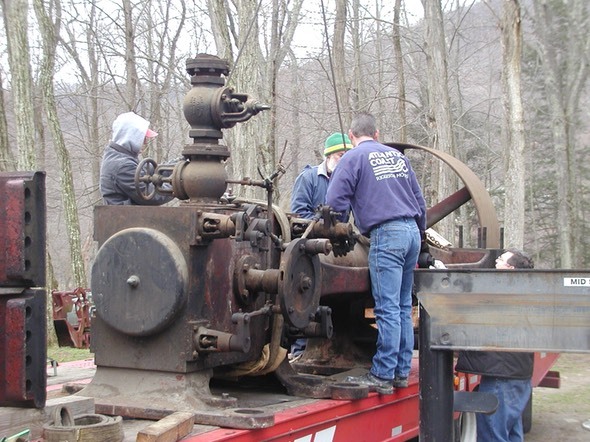 After being covered since the winter of 2006, the Nagle-Corliss crankshaft appears to be in excellent condition. 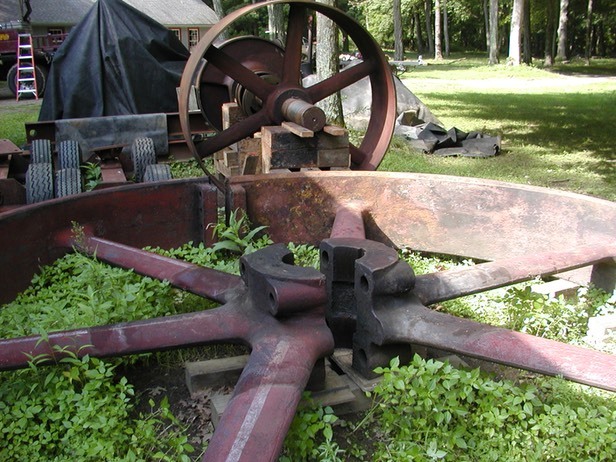 Here, next to the crankshaft, the two halves of the flywheel lie in the weeds none the worse for their outdoor storage. 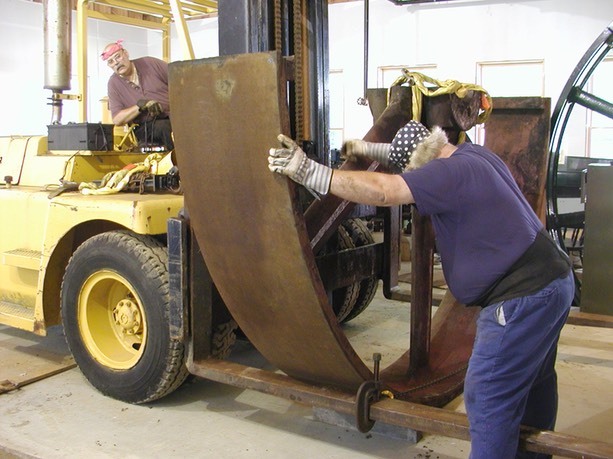 Tom Laganga of DBL Industries removes the inboard bearing cap with his 9 ton capacity Towmotor forklift. Working in the Industrial Hall is somewhat confining mostly due to the relatively low roof trusses. 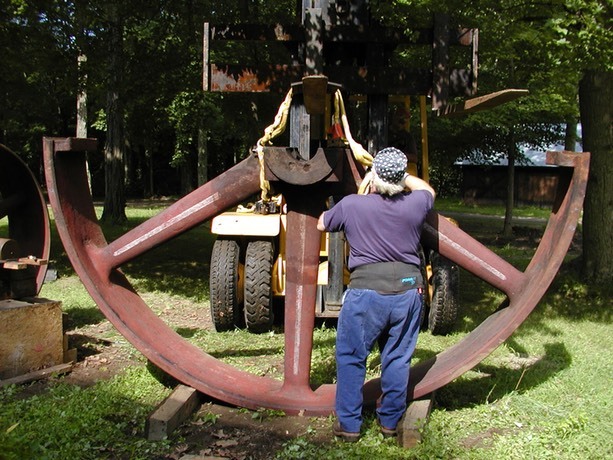 Using the fork lift, the lower half of the flywheel is first to go into position in the flywheel pit. This is the first of a number of picks needed to move it into position. To get the 12 foot wide flywheel half through the 11 foot door opening, this pick is used so the wheel can be spun on the fork. Once inside the Industrial Hall another pick is used with the forks spread wide enough to span the concrete pier of the outboard bearing. 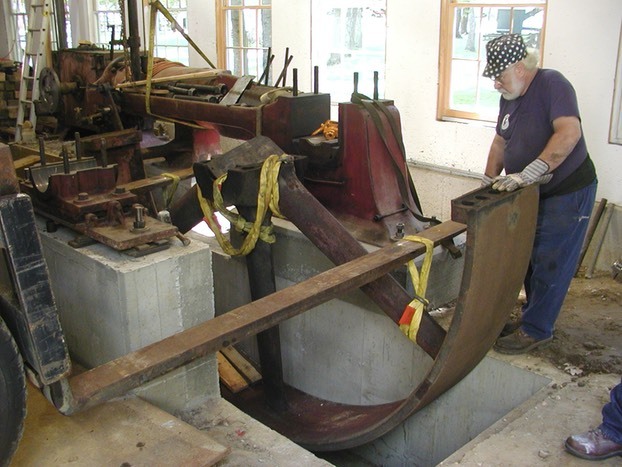 The flywheel is set down here for a final pick to lift it up and over the outboard bearing and lower it into the pit. Note the forks on either side of the pier. Nylon web straps are finally used to lower the flywheel half into the bottom of the pit. Again, the forks are spread wide to straddle the outboard bearing pier. 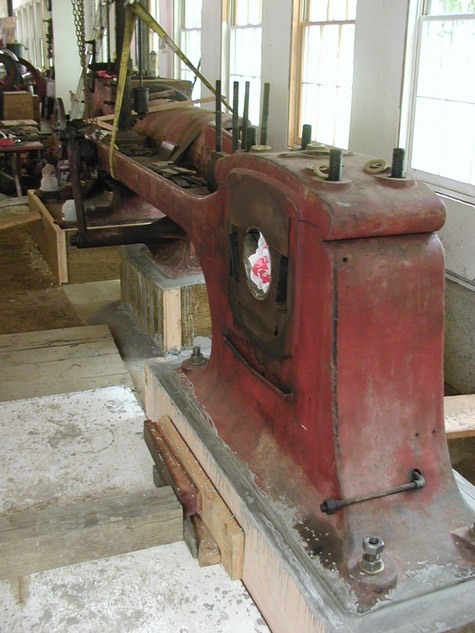 Next, the crankshaft assembly is aligned on the forks to move it into the Industrial Hall. 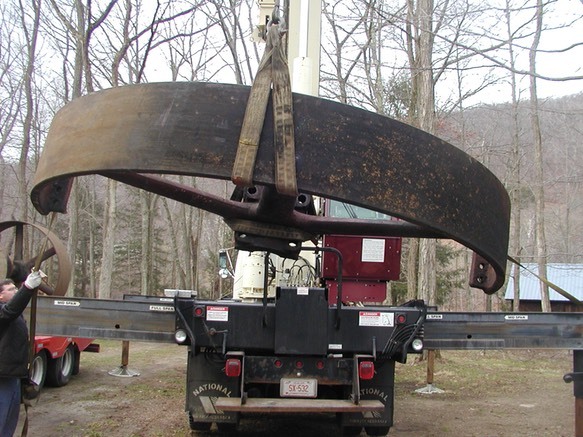 A temporary I-beam is used to support the weight of the front of the crankshaft. 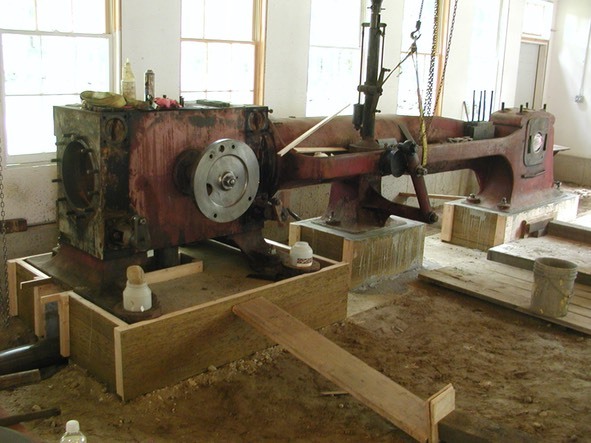 Now, the crankshaft can be moved into the building. This crank must be slung low so the top of the forklift can make it through the door and under the roof trusses. 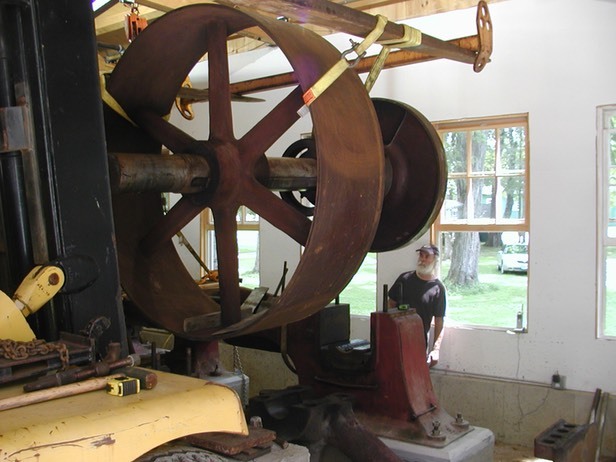 To move the crankshaft into its final resting place on the main bearings, it is now slung under the forks using web straps. This way it can be lowered into position without the forks interfering. The crankshaft is back home on the main engine bearings. Note however that the lower flywheel half is more than a foot below the crankshaft. 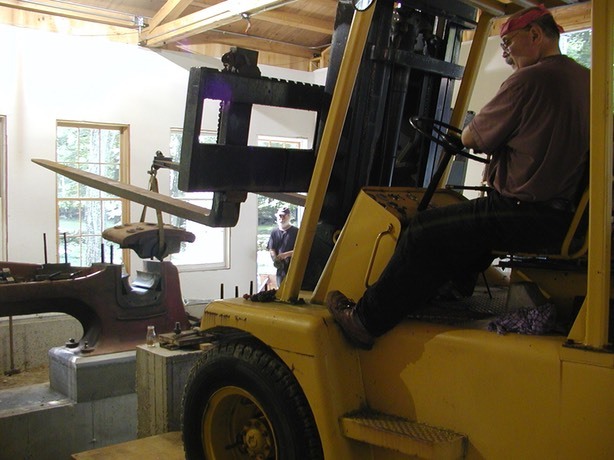 Using yet another pick, the forklift lifts the flywheel bottom up to meet the crankshaft. 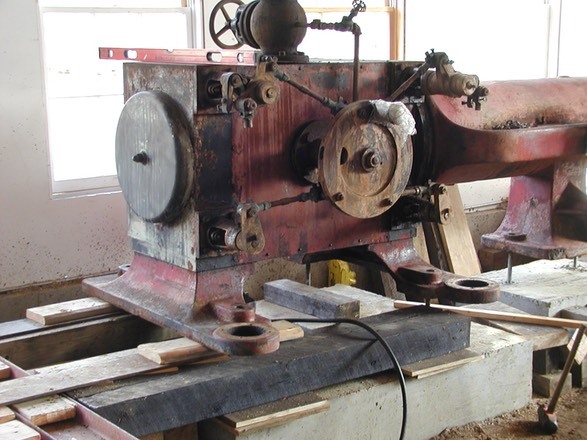 Temporary cribbing and wedges are used to support the flywheel half up against the crankshaft. 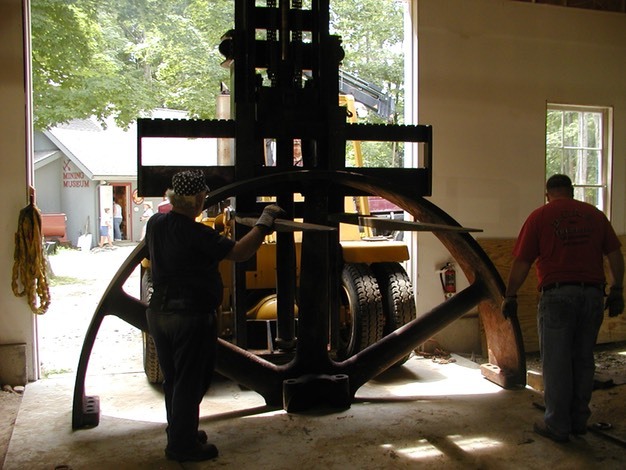 Now, the top half of the flywheel is moved into the building. 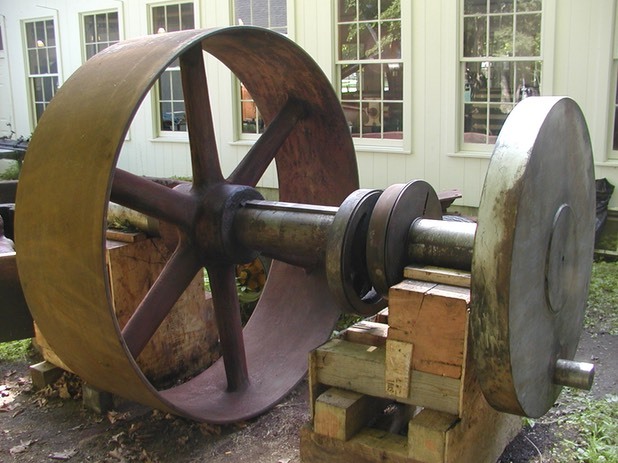 Once aligned with the crankshaft center, a chain is used to lift the flywheel half up and over the 6 foot diameter belt pulley. Chain is used since it does not stretch. 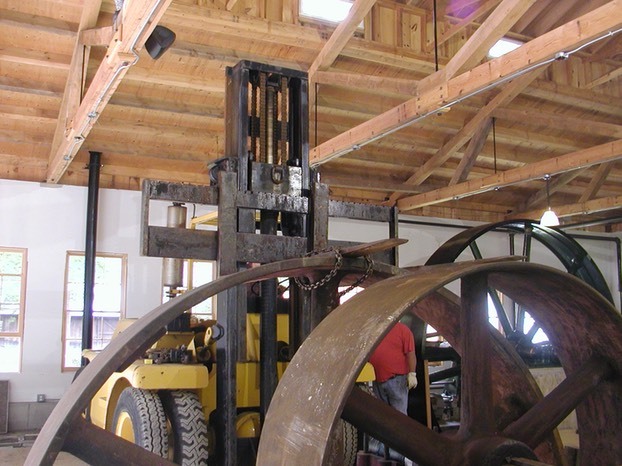 Literally, with inches to spare, the flywheel just barely fit between the roof trusses and the top of the pulley with the lift boom of the forklift fully extended. 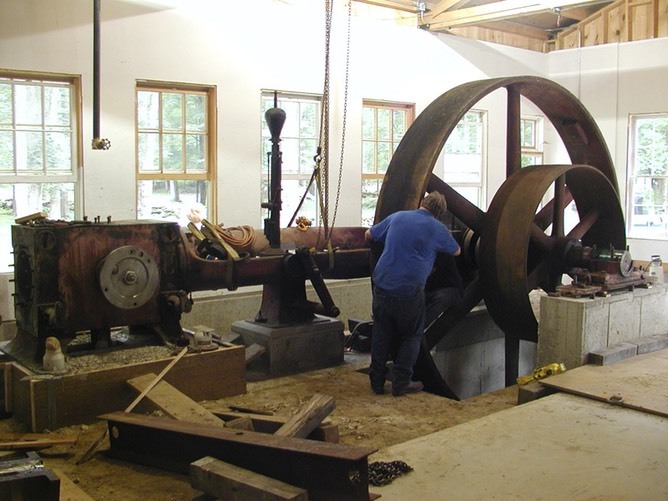 Here, the flywheel is being lowered into position on top of the crankshaft. Once the halves are aligned, they can be bolted into position. 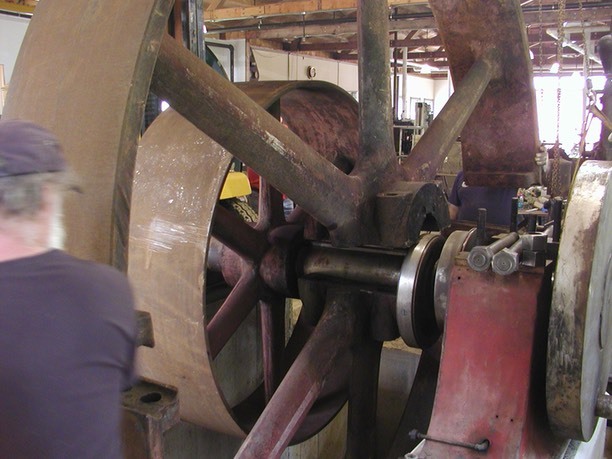 Here, the 12 large flywheel nuts/bolts are being tightened to finish assembly. Once again the major parts of the engine are together again. Cleaning and restoration of smaller parts is next. 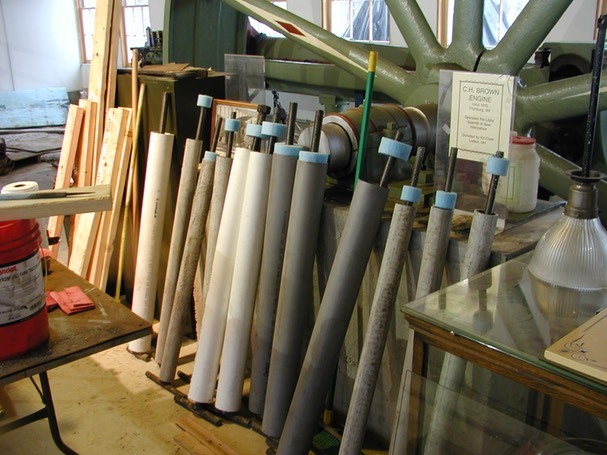 The last remaining flyball from the governor was sent to a foundry and used as a pattern to make a pair of replacements. The various smaller parts are must be cleaned.